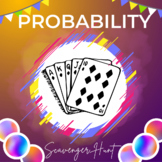 This Probability Scavenger Hunt Activity is designed to help your Algebra 2 students understand permutations, combinations, theoretical and experimental probability, independent and dependent events, two-way tables, conditional probability, and compound events at the end of the unit on Probability. Students love to do activities that allow them to be up and moving around the classroom. 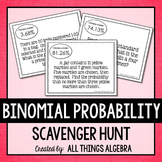 The Probability Scavenger Hunt allows them to do just that! 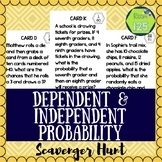 Each of the cards in this set provides the student with a scenario. 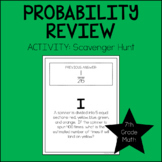 The included Student Activity Sheet has the questions for the students to solve. 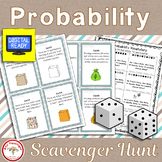 This is a 10-page statistics and probability problem solving activity that incorporates a scavenger hunt game. Student will start at a random number, work out that problem, then look for the answer on another poster. They will then work out that problem until they've worked out all ten. 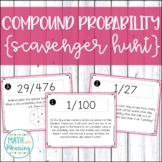 This listing is for a compound probability scavenger hunt, used to practice independent and dependent events. Answers are converted to percentages, as we use this to discuss how likely these events are to happen. 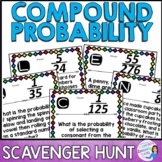 Included are 12 questions, an answer sheet for students, and an answer key. Enjoy!! 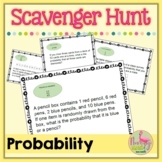 This is an online scavenger hunt to teach the concept of probability. The activity uses an online spinner and helps students with the concepts of least likely, most likely, and certain events. The student directions are very clear and concise and promote student exploration. Great tool!